Very good skiing here at Norefjell. There are many lifts and many runs, and the snow is always good and powdery. I take my children here once a year, and they love it too. Says Nils. The terrain being 49 acres, it's cozy enough to get to know all your fellow snow people. 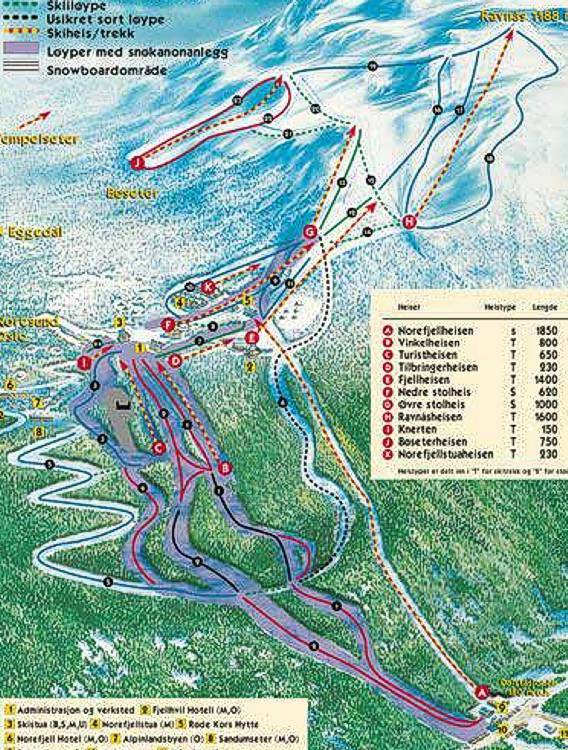 Norefjell is a relaxed ski hill having a relatively soaring altitude difference when compared to other Northern Europe ski mountains. This ski area has an average share of expert and advanced runs and an average part of green and blue trails. has a modest selection of trails and enough great ski lifts to serve them all. There are 10 good ski lifts here, and they are capably kept up and managed by kind folks. This ski resort has a drop of 3,280 feet which is fantastic. The grandiose mountain surroundings of Norway and fantastic trails are certain to keep you coming back. A pleasant workout and spending some quality time in nature have snow folks coming here. In winter the Norway hills are something you can’t pass up in case you're interested in skiing or snowboarding. Please refer to the trailmap of Norefjell on this page for information.